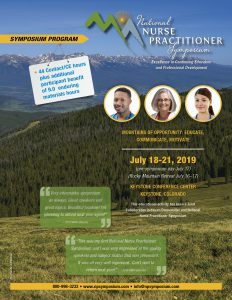 The 2019 National Nurse Practitioner Symposium will take place July 18-21, 2019 (pre-symposium day July 17; Rocky Mountain Retreat July 16-17), at the Keystone Conference Center in Keystone, Colorado. The 4-day symposium will consist of approximately 100 sessions and workshops, offering over 30 contact/CE hours for Nurse Practitioners, Nurse Midwives and Physician Assistants, through ACCME, ANCC and AANP, with acceptance of pertinent content by ACNM, AAPA and NAPNAP. 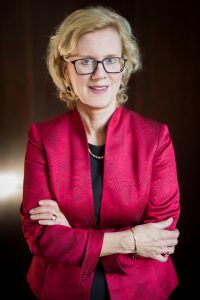 Content will include clinical topics, innovative practice settings, research, professional development and other topics related to advanced practice nursing in primary care and acute care. Please join us in continuing the tradition of excellence in continuing education and professional development in the beautiful Rocky Mountains of Colorado. Advancing Your NP Career: What is Your Next Step?